Best 4 Person Tent: Which Outdoor Shelter is Best for Summer Camping? Won’t you agree that it’s always fun to go camping with family and friends? Well, before you even think of having fun while camping, you have to make sure that you have the right type of shelter. If you want you and your companions to sleep under one roof (or tent for that matter), having the best 4 person tent is pretty much a requirement. However, shopping for a 4 person tent has its fair share of challenges, especially when there’s a lot of brands and models out there. To help you out, we have compiled a list of considerations that will want to take into account when shopping for a big outdoor tent. On top of that, we have thrown in some recommendations your way, so make sure that you check them out. Below are some of the types of features that you want to look at when you’re trying to find the ideal tent for your group. Keeping pack weight down is critical to enjoying backpacking trips. Some tents have lots of features, like pockets and gear lofts, while some come with a complicated plastic pole hub that adds more bulk than weight or simply doesn’t collapse well. Consider how bulky or compressible the materials are and whether you can easily squeeze or stuff them into your backpack around other gear. Lightweight tent options make backpacking trips more fun and that’s what it’s all about. You can check individual product reviews for the weight of each component. An additional component to consider when it comes to weight is the footprint. Many lightweight backpackers view a footprint as unnecessary and, for many users, this is something that might not be on their radar. However, a footprint could save a lot of headaches down the road. The main benefit of a footprint is adding durability to the floor of your tent. A footprint will protect your tent floor from abrasion, so it will last longer and need fewer or no repairs. We’ve found that the importance of durability increases with trip duration. Hikers tend to worry a little too much about the durability of lightweight backpacking products. Lightweight backpacking gear is less durable than heavy duty equipment unless you’re really tough on gear. Repairs take time, and equipment failure has larger consequences in more remote areas and on long distance hikes. Quality lightweight backpacking equipment is still built to last, but if you stick to the weekend warrior trips, a heavier tent will likely last longer. Versatility refers to how well a tent performs across a wide range of conditions and climates. We also compare how well they work in rain wind, and desert climates. Tents that are more versatile are a better value. This is the category to consider carefully if have any specific needs for setup, like one that is easy for kids to set up, or one that is easy for solo setup to avoid arguments while pitching your tent. You know, the kind that happens when you finally arrive at the campground after a long and stressful week followed by a long and stressful drive and all you want to do is chill out and relax. Tents must be simple and easy to be opened up to deploy. Some tents are exceptionally intuitive to set up while some may remind us of an adult sized erector set. Tents must be very strong, providing excellent wind resistance. Tents that have small diameter poles are likely to bend and snap if exposed to high winds, and tents with a single center pole are susceptible to collapsing in high winds. However, campers are outside through all types of weather, which includes the wind, scorching heat, blowing sand and dust, and even hail storms. A wide range of specialized nylons and polyesters are used in tents as technology evolves rapidly. The best tent fabric ranges from super strong to relatively light silicone coated nylon. You will mostly want to use this in hot weather since the cotton in the fabric makes it a little light for autumn/winter trips. The tent poles and design of 4 person tents define the durability of the tent as a whole. The tent’s overall pole design, the number of poles, and the number of pole crossings relative to its size and external height are one of the biggest factors contributing to a tent’s strength. The materials used in making the pole also count. Other features of tent design are door shape, zippers, and other adjustments. Two doors and two vestibule tents are by far the most luxurious because each person has their own entry and exit. 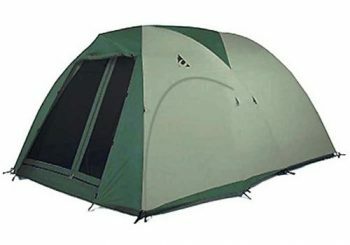 Tents with a single side door are the least comfortable because someone has to climb over the other person in order to get in or out of the tent. Having two sets of doors and vestibules every time you want to get in or out of your tent is a huge bonus. Camping trips are meant to be fun, stress free bonding experiences, or a chance to catch up with friends over a beer or s’mores. In the case of the comfort of a tent, we consider solid or mesh walls, door and vestibule design, peak height, floor area, the number size of pockets, and vestibule area in the tents. A comfortable tent must perform well in rain or shine, more pockets for storage and organization and must not get too hot in the sun. For more specific comfort requirements check each tent review. Finally, tents need a feature that prevents condensation. Usually, double wall tents have improved air circulation and less condensation than a single wall tent. You need mesh windows or panels, along with zipping panels to close over when too much cold air creeps in. Now that we’ve gone over what you need to consider before buying your tent, let’s talk about the products! Description: The Coleman Sundome Tent is considered one of the best tents for family camping. There are many features that make this tent stand out among others, but the most amazing thing about this tent is it can easily be setup. Instead of scrambling while trying to get the whole thing set up, the tent can be easily pitched in about 15 minutes. The dome style tent for 4 backpackers mostly does not offer ventilation options, but the large windows in this tent make it a favorite. Just like other Coleman tents, it also has WeatherTec built into the walls that keeps you dry. Inside there is an interior gear pocket and an electrical access port for added convenience. Overall, it’s hard not to recommended this tent to families and groups. It’s easy to set up, offers good ventilation and it’s overall a good quality outdoor shelter. 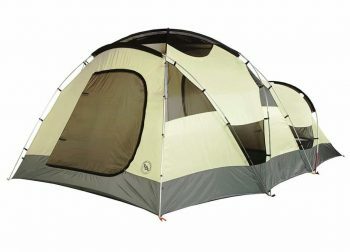 Related: For another great Coleman tent for your group campouts, check out the Coleman Carlsbad 4 Person Dome Tent. This tent features a vented vestibule for extra space. 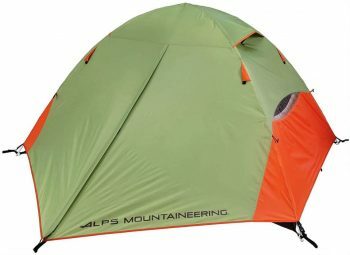 Description: The ALPS Mountaineering Taurus is a great choice for those looking for a true backpacking tent. The polyester fly will keep you secure and snug in almost all weather and with a fixed vestibule, you will have room to store any extra gear while you wait out the storm or sleep the night away. 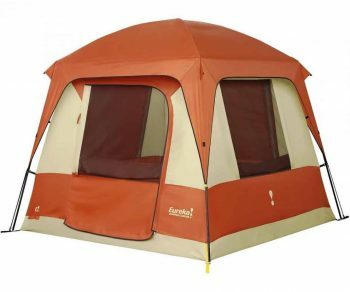 This tent is a great choice for a family backpacking trip or a family campground adventure. The tent’s end walls are waterproof and are lengthened halfway up the tent, closing out the need for fly coverage and thus saving weight. The two doors each have a mesh window, which is great for ventilation and when it’s time to put on the fly, you won’t have to worry about losing your fresh air. The fly has additional vents for continued ventilation. Overall, it’s a solid group tent with great features and price point. Related: If you need a pad to go with your new tent, check out the ALPS Mountineering Lightweight Series Self Inflating Pad. This high quality pad is the perfect addition to your next backpacking trip. Description: The EUREKA! Copper Canyon Tent has vertical walls that maximizes the space inside and are ideal for cot use. The zippered E! Power Port allows you to bring an electrical power cord inside the tent. The tent is free standing and has a steel frame and shock corded fiberglass that are easy to set up. Seriously, setting up could only take a couple of minutes. Bathtub floor wrap up sides protect against standing and splashing water. A gear loft is present overhead which can be used for storage. Some of the downsides to this tent are its weight and its insulation capacity. For backpackers and cold weather campers, a smaller, lighter model might be a better choice. However, this tent is an excellent tent if you’re going car camping with family and friends. Description: The Kelty Grand Mesa 4 Tent is simple and reliable 4 person tent. This tent features just two lightweight, color coded poles and clips for an easy, free standing design that you can set up with minimal effort. The upper sections of the tent walls are made of fine no see um mesh that offers excellent ventilation and airflow during the warmer months. To add to the value, it also features a roll top carry cube bag and multiple storage pockets. The floor of the tent has fully taped seams so you can trust that no rogue moisture will find its way in. There’s also a storage vestibule that you can use to stash some of your stuff while in the basecamp. There’s not much to be said about this tent other than it gets the job done very well as far as 4 person tents go. Related: Kelty also makes another 4 person tent – the Kelty Trail Ridge 4. This 3 season tent features even more ventilation and a higher center for more room to move around. 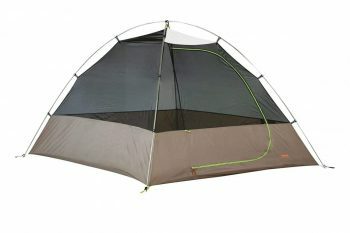 Description: The Chinook Twin Peaks Guide Tent is designed for tougher conditions like wind and rain. Thanks to the high quality materials and heavy duty construction. The Twin Peaks features a four pole configuration and a 2 in 1 tent system which does wonders for increasing the livable space. One roomy sleeping dome, with a practical and functional screened dome and a removable heavy duty floor, will make you the green eyed monster of the campground. This tent also has a waterproof coating and UV treated design which is just some of the most noteworthy design features. All in all, if you’re looking for a 4 person tent that has good room, this tent is an easy recommendation. It’s not the most affordable tent out there but it more than makes up for its longevity and performance. Related: For some added comfort in the Twin Peaks, check out the Chinook Heavy Duty Padded Cot. It can provide you with superior comfort and warmth with its built in pillow design and adjustable backrest. 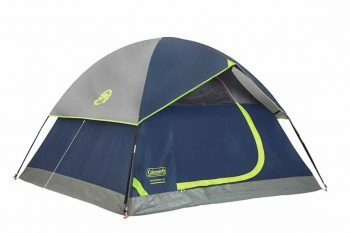 Description: The Marmot Limelight 4 Tent uses four DAC aluminum poles and color coded clips and sleeves to pitch quickly, stand solidly, and provide plenty of room for the whole family to sleep without making each other miserable. Another thing that you will notice right away are the high quality materials and construction. This tent offers backpackers a comfortable space and yet lightweight construction with easy setup. It even has enough space to store your backpacking gear and equipment. The fly is made of polyester ripstop, the walls and floor of tough polyester and nylon, and all the seams are fully taped to keep water from getting you and your gear wet. Limelight also offers great value for your money as it comes with complete footprint and gear loft. It’s a fairly priced tent that delivers in terms of comfort, performance and features. 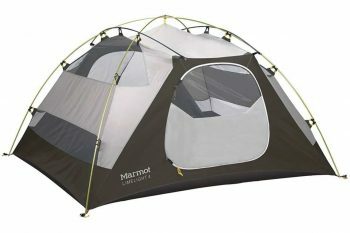 Related: For a slightly smaller option from Marmot, check out the Marmot Force 3 Person Tent. This three season tent is perfect for small backpacking groups as it is lightweight but boasts high quality materials and construction. Description: The Big Agnes Flying Diamond Deluxe Tent has a strong weather resistant design to inspire confidence and to have a positive camping experience. The doors feature two closing options. You can use the zip up mesh door for ventilation purposes or you can zip up the polyester layer in case you want total protection. Its mesh walls work with the lightweight but durable rain fly to keep condensation and moisture out of the tent. Sleeves and plastic clips attach the tent body to the pole frame for quick and easy setup. Footprints are sold separately. As you may notice that it is an 8 person tent. Well, this only means that with four people, you’ll get to have enough livable space without getting under the skin of your companions. However, it also comes with a premium price. Related: Add even more comfort to your camping experience with the Big Agnes Buell 30 Sleeping Bag. This cozy bag will keep you toasty all night with its DownTek water repellent down and breathable shell fabric. There are lots of tents out there for you. 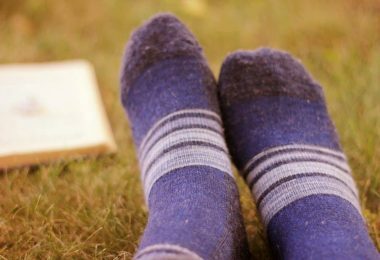 In this post, we were able to help you make an educated decision and find the best 4 person options that will keep you warm, dry, and protected in the outdoors for many years to come. What do you think is most important when it comes to choosing your next tent? What kind of tent did you choose for your camping companions? The comment section is down below!